Yes, I’m beating the Caol Ila drum again. Having already found the perfect Caol Ila, this time I was veering away from the distillery releases and towards independent bottlings. This time it was one from the Signatory Cask Strength Collection. I’ve only ever had one dram from this range before – a vintage Bunnahabhain, in a bar – and it was astonishingly good. They are, it must be said, not cheap bottles. 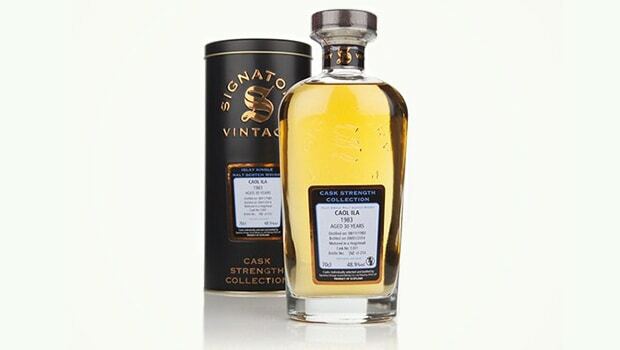 So when I saw a £10 sample of the Caol Ila 30 Year Old 1983 still for sale at Master of Malt, I thought I’d treat myself. Signatory is a family-owned company, founded in 1988 by Andrew Symington. Since then they now own the Edradour Distillery, the tiniest distillery in Scotland, having bought it in 2002 from Pernod Ricard. But they continue to release some very well-respected independent bottlings, the majority of which are single casks. And one of which was this old Caol Ila. Colour: amber, deep gold. Surprisingly pale considering the age. On the nose: ever so gentle sweet peat, mixed with the last embers in the hearth. Mossy, with a real earthy, estuary, bog-like nose. This is peat cut from the land, something you can almost hold never mind about smell. Extremely delicate though, not at all in your face. In the mouth: sometimes you get whiskies that are incredibly well-balanced, a perfect mix of sweet and sour, of smoke and sugar, brine and treacle. This is one of those whiskies. There’s almost no point talking about anything else, because that might ruin those first impressions. But it’s worth commenting on that background brininess, the fishing nets, eating smoked kippers after a day sailing on the Atlantic followed by treacle sponge and custard. A granular, mineral note like that of a dry Riesling. To be honest, this is a pricey whisky – £200 a bottle, at least, if you can find one. When prices get into this realm, what I say will be fairly useless. You buy whiskies at that price because you already know what you’re doing. What I will say is this: I enjoyed it immensely, but it sort of transcended my usual experience. It’s a mood whisky, an occasion dram. Mid-winter, 9pm, when a gale is blowing and the world is against you. This is the sort of whisky to bring you out of a very dark place and give you hope. We’re onto the second of the two existing releases from the guys behind Port Sgioba after the distinctive and excellent Port Charlotte debut. Yes, and..